For yesterday's town Ragamuffin parade, Miss M. wore a Scooby Doo costume handed-down by a neighbor. 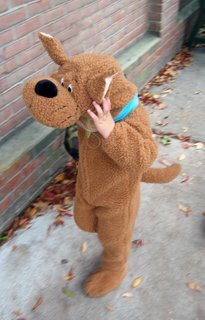 Lots of people said "Hi Scooby! ", "Look, there's Scooby!". The great thing is, she has no idea who (what?) Scooby-Doo is. Although, to be perfectly honest, I don't think I've ever seen a Scooby-Doo cartoon either.